"Ali bin Hussein" redirects here. For other uses, see Ali bin Hussein (disambiguation). Ali ibn Husayn (Arabic: علي بن الحسين‎), also known as Zayn al-Abidin (the adornment of the worshippers) and Imam al-Sajjad (The Prostrating Imam), was the fourth Shia Imam, after his father Husayn ibn Ali, his uncle Hasan ibn Ali, and his grandfather Ali ibn Abi Talib. Ali ibn Husayn survived the Battle of Karbala in 680 CE, after which he and other surviving family members and companions of Husayn were taken to Yazid I in Damascus. Eventually, he was allowed to return to Medina, where he led a secluded life with a few intimate companions. Imam Sajjad's life and statements were entirely devoted to asceticism and religious teachings, mostly in the form of invocations and supplications. His famous supplications are known as Al-Sahifa al-Sajjadiyya. 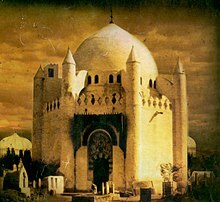 The historical tomb of Al-Baqi' was destroyed by Saudi Monarch in 1925. Imam Ali ibn Husayn is one of four Shia Imams buried here. Muhammad al-Baqir according to the Twelver, and Ismaili Shia, Zayd bin Ali according to the Zaidiyyah Shia. Ali ibn al-Husayn was born in Medina, modern-day Saudi Arabia, in the year 38/658–9. [a] He may have been too young to have remembered his grandfather Ali; he was raised in the presence of his uncle Hasan and his father Husayn, Prophet Muhammad’s grandchildren. It is said that Ali ibn al-Husayn was related through his mother Shahrbanu, the daughter of Yazdegerd, to the last Sassanian King of Persia. [b] Ali ibn al-Husayn was known as Ibn al-Khiyaratayn, the "son of the best two (the Quraysh among the Arabs and the Persians among the non-Arabs)". Ali ibn Abi Talib suggested allowing her to choose a husband from among the Muslims and paying her mahr from the public treasury. Umar agreed; she chose Ali’s son Husayn. She is said to have died shortly after giving birth to her only son Ali. And in other stories this happened during the caliphate of Othman and Ali ibn Abi Taleb. Ali ibn al-Husayn is also related through this Sassanid Persian bloodline to the Byzantine emperors Maurice and Tiberius II through princess Mariam (Historically known as Shirin) the daughter of emperor Maurice. And also to king David through Shushandukht mother of Bahram V.
In 61/680 , Muhammad's grandson Husayn ibn Ali and a small group of supporters and relatives were martyred at the Battle of Karbala by the large military forces of the Umayyad caliph Yazid, to whom Husayn had refused to give an oath of allegiance. Zayn al-Abidin accompanied his father on a march toward Kufa; he was present at the Battle of Karbala but survived the battle because he was ill. Once the Umayyad troops had martyred Husayn and his male followers, they looted the tents and took the skin upon which he was laying. It is said that Shemr was about to kill Zayn al-Abidin but his aunt Zaynab made Umar ibn Sa'ad, the Umayyad commander, spare his life. Zain al-Abidin and the enslaved women were taken to the caliph; eventually he was allowed to return to Medina. During the journey, he delivered speeches in Kufa and Damascus, and informed the people of his father's intentions. Kufa's people invited Husayn to go to Kufa and be their Imam, but they did not back him and his family against Kufa's governor, who massacred them in Karbala. Thus they thought themselves responsible for the tragedy of Karbala and tried to compensate for it by throwing themselves into the struggle to obtain vengeance for Husayn's blood. They chose Sulayman b. Surad al Khuza'I as their leader and called themselves Tawwabun (penitents). They were seeking an opportunity for action, until Mukhtar al-Thaqafi came to Kufa and claimed to represent Muhammad ibn al-Hanafiyyah. He soon gained the authority of a leader and took vengeance on those who were involved in Husayn's killing. Umar ibn Sa'ad and Shemr were executed and their heads were sent to Muhammad ibn al-Hanafiyyah. Ubaid Allah was also killed in the battle on the Zab; his head was taken to the place in Kufa where Ubaid Allah had received the head of Husayn. The governor of Medina did not consider that Zayn al-Abedin was responsible for Mukhtar's action, since he had already left Medina for its outskirts to avoid being involved in political movements. Moreover, there is evidence that he was unmolested and excepted from giving allegiance to Yazid, after the Battle of Harra, where Medinans were sacked and looted by Yazid's army. It is narrated from the Imam that when he saw a beggar weeping, he said: If the world was in his hands and suddenly it dropped from him, it would not be worth weeping for. The Imam renounced worldly pleasures but did not give way to poverty and feebleness, rather he was "pious with what God prohibited". The Imam was self-denying and turned away from the world,[f] and Sufis consider him as Sufi and wrote biographies about him. According to William Chittick, the Al-Sahifa al-Sajjadiyya is the "oldest prayer manual in Islamic sources and one of the most seminal works of Islamic spirituality of the early period". Shia tradition considers this book with great respect, ranking it behind the Quran and Ali’s Nahj al-Balagha. This prayer book deals with Islamic spirituality and provides teachings on levels from the theological to the social. The traditional category of "faith", for example, which forms the basic subject matter of most of Islamic thought as developed in kalaam philosophy and Sufism, has been discussed in this book. Zayn al-Abidin refers frequently to Islamic practices, emphasizing the necessity of following the Quran and the hadith's guidelines, and the necessity of establishing justice in society. The Fifteen Whispered Prayers also known as The Fifteen Munajat, is a collection of fifteen prayers attributed to Zayn al-Abidin, which some researchers regard as a supplementary part of the latter collection. These prayers enable a person to recite the prayer that is most in accordance with his present mood. The prayers start with repentance, which is the first step towards a genuine communion with God. According to Abu Hamza al-Thumali, during the month of Ramadhan, Imam Zayn al-Abidin would spend most of the night in prayer. At the beginning of the fast, he recited a supplication later known as Du'a Abi Hamzah al-Thumali (The supplication of Abi Hamzah al-Thumali). This supplication is recorded in the book Misbah al-Mutahijjid of Shaykh Tusi. Zain al-Abidin’s Treatise on Rights is the only work other than supplications, short sayings and letters, attributed to him. According to Chittick, this treatise is especially important because it deals with many of the same themes as the Sahifa in a different style and language. In this book, Zayn al-Abidin clarifies that a hierarchy of priorities must always be observed: The individual comes before the social, the spiritual before the practical, and knowledge before action. Each human being has a long series of social duties, but these depend upon his more essential duties; faith in Allah, and placing one’s own person into the proper relationship with the Divine Reality. Zayn al-Abidin was poisoned by Umayyad ruler Al-Walid through the instigation of the Umayyad caliph Hisham ibn Abd al-Malik in Medina. The date of his death is 95/713-14; he was buried next to his uncle, Hasan, in the cemetery of Al-Baqi' cemetery in Medina. After his death many people discovered their livelihoods had come from him. He would go out with a sack of food on his back, knocking at the doors of more than 100 families, and gave freely to whoever answered while covering his face to avoid being recognized. ^ Her name has also been given as Shah-Zanan, Sulaafa, Ghazaala, and Shahr-Banuya, among others. ^ Abū Khālid al-Kābuli was among those who confessed the Imamah of Muhammad ibn al-Hanafiyyah, but turned to Zayn al-Abedin afterwards, saying "I served Mohammed b. al-Hanafiya for a time of my life. I had no doubt that he was the Imām till I asked him by the Sacredness of Allah, the Sacredness of the Messenger, and the Sacredness of the Commander of the faithful, so he guided me to you and said: ‘Ali b. al-Husayn is the Imām over me, you, and all the creatures.’"
^ Canon Sell, op. cit., p. II, quoting Sahifat Al-Abidin, p. 184. ^ It goes as follows: "It is someone whose footsteps are known by every place / And it is he who is known to the bayt in Mecca,(i.e. the Kaaba) The most frequented sanctuary; / It is he who is the son of the best of all men of Allah;(i.e. the Prophet Muhammad) / and it is he who is the most pious and devout, the purest and most unstained, the chastest and most righteous, a symbol [for Islam]; / This is Ali [b. al-Husain] whose parent is the Prophet; / This is the son of Fatimah, if you do not know who he is; / Whosoever recognizes his Allah knows also the primacy and superiority of this man; / Because the religion has reached the nations through his House..."
^ It is said that al-Zuhri when he was asked about the most ascetic one, he answered: “The most ascetic of all the people is Ali b. al-Husayn. ^ "Imam Ali Ibn al Husayn (as)". Al-Islam.org. Retrieved 4 July 2015. ^ Shabbar, S.M.R. (1997). Story of the Holy Ka’aba. Muhammadi Trust of Great Britain. Retrieved 30 October 2013. ^ Shaykh al-Mufid. "The Infallibles – Taken from Kitab al Irshad". Retrieved 2009-05-12. ^ a b c d e WOFIS (2001). A Brief History of the Fourteen Infallibles (3rd ed.). Tehran: World Organization for Islamic Services. ^ A Brief History of The Fourteen Infallibles. Qum: Ansariyan Publications. 2004. p. 111. ^ a b c ibn Khallikan. Ibn Khallikan's biographical dictionary. 2. p. 209. ^ Tabataba'i, Muhammad Husayn (1979). Shi'ite Islam. State University of New York Press. p. 201. ^ Imam Ali ibn al-Hussein (2001). The Complite Edition of the Treatise on Rights. Qum: Ansariyan Publications. p. 16. ^ a b Dungersi Ph.D., M. M. (December 1, 2013). A Brief Biography of Ali Bin Hussein (as). CreateSpace Independent Publishing Platform. ISBN 1494328690. ^ a b c d e f Madelung, Wilferd. "ʿALĪ B. ḤOSAYN B. ʿALĪ B. ABĪ ṬĀLEB". ENCYCLOPÆDIA IRANICA. Retrieved August 1, 2011. ^ Muh’sin al-Ameen al-A’mili, A’yan as-Sheea’h, Damascus, 1935, IV, 189. ^ a b c d e f g h Donaldson, Dwight M. (1933). The Shi'ite Religion: A History of Islam in Persia and Irak. BURLEIGH PRESS. pp. 101–111. ^ a b khalil, ahmed. "الإمام علي زين العابدين حياته ونسبه: بحث في الحلقة المشتركة بين الأشراف والساسانيين والبيزنطيين وسبط he played roblox thereيهوذا". ^ Heli, Ja'far ibn Mohammad ibn Nama (2001). Mosirol ahzan [در سوگ امیر آزادی]. Iran-Qom: Hazeq. p. 399. ^ Ibn Kathir. Al-Bidāya wa-n-nihāya "the beginning and the end". 8. p. 274. ^ Lalani, Arzina R. (March 9, 2001). Early Shi'i Thought: The Teachings of Imam Muhammad Al-Baqir. I. B. Tauris. p. 31,78. ISBN 978-1860644344. ^ Shaykh Hurr al-`Amuli. Al- Fuṣūl al-muhimma fī taʼlīf al-umma. Najaf: An-Naǧaf : Dār an-Nuʻmān li'ṭ-Ṭibāʻa wa'n-Našr. p. 192. ^ Munūfī, al-Sayyid Maḥmūd Abū al-Fayḍ (1967). Jamharat al-Awliyā', vol. 2. Al-Qāhirah Mu'assasat al-Ḥalabī. p. 71. ^ Chirri, Mohamad Jawad (1986). "Al-Sahifat Al-Sajjadiyya" (Revised ed.). The Muhammadi Trust of Great Britain and Northern Ireland. ^ "A glance at three translations and seyyed mehdi shojaee's viewpoint about the Ramadan's prayers" (in Persian). IBNA. Retrieved 1 October 2014. ^ a b Mesbah-Yazdi, Mohammad-Taqi (1390). Sajjadeha-e Soluk (in Persian). The Imam Khomeini Education & Research Institute. ^ Māmqānī, ‘Abd Allāh (2002). Tanqīḥ al-maqāl fī ‘ilm al-rijāl (in Arabic). Qum: Mu’assasat Āl al-Bayt li-Iḥyā’ al-Turāth. ^ Moosa, Matti (1987). Extremist Shiites: The Ghulat Sects. Syracuse University Press. p. 92. ISBN 9780815624110. Retrieved 21 July 2014. ^ Shaykh al-Mufid. Imam Ali Ibn al Husayn (as). Retrieved 21 July 2014. Sharif al-Qarashi, Bāqir (2000). The Life of Imām Zayn al-Abidin (as). Translated by Jāsim al-Rasheed. Iraq: Ansariyan Publications, n.d. Print. Imam Ali ubnal Husain (2009). Al-Saheefah Al-Sajjadiyyah Al-Kaamelah. Translated with an Introduction and annotation by Willian C. Chittick With a foreword by S. H. M. Jafri. Qum, The Islamic Republic of Iran: Ansariyan Publications. Jafri, Syed Husain Mohammad (1979). The Origins and Early Development of Sheea’h Islam. Beirut: Oxford University Press. Life of Imam az-Zayn al-Abideen as-Sajjad by Dr. Muhammad bin Yahya al-Ninowy .